I just got home from the Mother Earth News fair in Seven Springs, PA and found this already up on the MOTHER EARTH NEWS FAIR Facebook page. I think Eleanor is 13 now. You might remember I mentioned her last year after I met her at the MEN Fair. She succeeded in clearing $6000 in her first year, when she was 11. She now sells at two farmers’ markets. Her talk, Lemonade to Lettuce, with help from her dad Matt Wilkinson, was clear, informative and engaging. I thoroughly enjoyed making the surprise presentation of my book at the end of her talk. Despite the shock, Eleanor was quickly professional in dealing with all the photographers and the public. A “growing farmer” to watch! I gave out 300 handouts for this one, and some couples shared a copy. For Fall Vegetable Production, I revised my presentation from last year’s (which can still be found on SlideShare). I’ll be putting the new one up in a few days. I gave out 360 handouts on that one. and I shared a dinner table with Ros Creasy and later traveled home with her (and Ira Wallace and Gordon Sproule). Long ago, when I was looking for a publisher for my book, Ros advised me that writing a book was going to be a lot of hard work. Her advice was good: she was right, and she didn’t dissuade me! And meanwhile in the garden, the spinach seedlings are battling with faster-growing buckwheat seedlings, because we didn’t till the preceding cover crop of buckwheat in time. The weather is cooling down, and remaining dry. An advantage as far as hoeing goes. I just have to remember to keep switching irrigation on and off. My next speaking event is the Mother Earth News Fair at Topeka, Kansas, Oct 25-26. Last week I wrote about transplanting cabbage and sowing kale. We were having “great transplanting weather”, that is, it rained a lot! We filled all the gaps in all 12 rows of broccoli and cabbage in a single hour with four people. There weren’t many gaps, happily. That’s about 1400 broccoli plants and 700 cabbages, our usual amount to feed a hundred people. This week in the garden, it’s about three weeks since we started the transplanting, so the first rows are ready to be uncovered and hoed. Happily, we now have great hoeing weather! No rain in sight for a week. Central Virginia weather is very variable, and our particular spot is drier than the surrounding area, so if the forecast says 30% chance of rain or less, we are very unlikely to get any. There’s currently a forecast with a 50% chance of rain in 6 days (Monday night). If we can get all the hoeing done, and till or wheelhoe between the rows, then I can broadcast a clover mix and welcome some rain! We like the wheel hoe if the weeds are not too big and not too grassy. The first few rows were quite grassy, so we used our BCS 732 tiller from Earth Tools. We cultivate around the brassica plants, then broadcast a mix of clovers: 1 oz crimson clover, 1 oz large white Ladino clover and 2 oz common red clover (medium, multi-cut) per 100 square feet. Then if it doesn’t rain, we water like crazy for a few days, which is all it takes to get the clover germinated. We have drip tape for the brassicas, but we need overhead sprinklers for the clover mix. The crimson clover is the fastest growing in the fall, and the others gradually take over in the spring and summer of the next year. We like watching the progression from crimson clover to red to white as each type comes into its strength. Broccoli in the late fall after the clovers grow. In March, the old broccoli trunks are surrounded by a sea of green clover. I’ve written up this method as part of an article for Growing for Market magazine, for the September issue. And now our bad news – more nematodes in the hoophouse. When we pulled up our early tomatoes, the roots of four of them in one bed were gnarly with lumps. It’s the return of the Root Knot Nematodes. In the early spring of 2011 we found spinach with lumpy roots. We sent some plants with soil attached, to the Plant Diseases Clinic and got the diagnosis of Peanut Root-Knot Nematodes. We put that half a bed into a series of cover crops, (wheat and white lupins in the winter, French marigolds and sesame in the spring) and solarized it each summer, for two years. In the summer of 2013, we grew Mississippi Silver cowpeas there (resistant to RKN). This past winter we grew lettuce in the that affected half-bed. 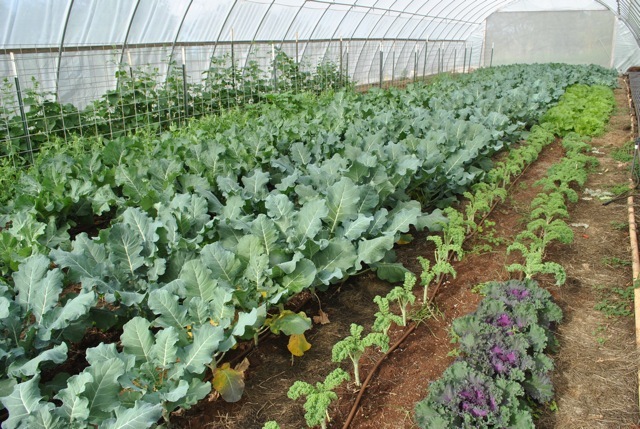 We benefited – no sclerotinia drop in that lettuce crop, thanks to the summer solarization! Meanwhile in the early summer of 2013, we found some beans with lumpy roots in the other half of the bed, so we started the same treatment there. 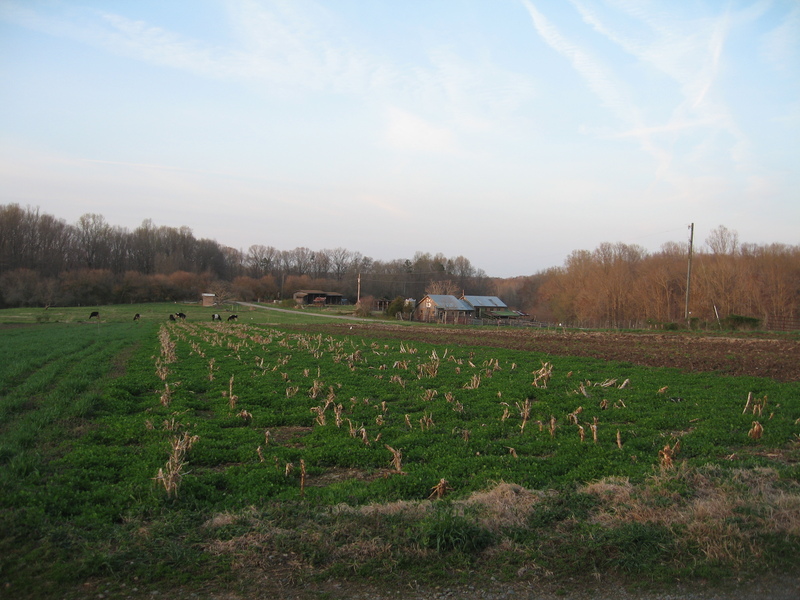 Next summer (2015) we could grow the cowpeas there. Our first (baggy) attempt at solarization in the hoophouse. But now the next bed over has nematodes. Having a half-bed out of production is manageable, but one and a half is more of a blow. We are considering whether we need to be as cautious, or whether we should accept that some level of nematode infestation is likely in hoophouses in the south. We are looking at various scenarios. This research has consumed all my available time this week. 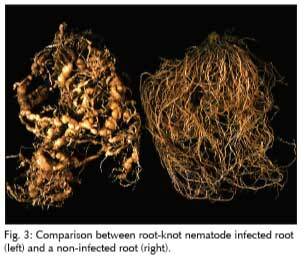 Information about nematodes is sometimes too general to be useful, as there are many kinds other than root-knot ones. Plus, what’s true for Peanut RKN is not necessarily true for Southern RKN or Northern RKN. Grr! I’ve assembled a long list of tomato varieties resistant to some kind of RKN, although I don’t yet know which of them are resistant to Peanut Root-Knot Nematode. Many, many food crops are susceptible. 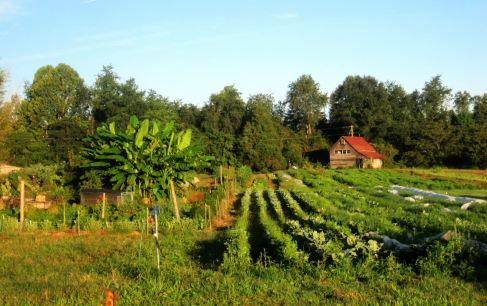 Most of the resistant crops are ones we don’t want to grow in the hoophouse: Jerusalem artichokes, globe artichokes, asparagus, horseradish, rhubarb, maybe sweet corn (opinions vary on its resistance/susceptibility). Maybe we could grow West Indian gherkins one summer. We’d get soooo many pickles! It’s a very productive crop for us. One idea was to build a second hoophouse and use the old one for (resistant) strawberries for two years! We’re not really at the place to do that, though, financially or time-wise. Currently I’m studying a list of biocontrols to see what’s available and affordable. Life goes on. Hopefully we can decide at our crew meeting on Thursday, because we can’t start to implement our fall planting schedule in the hoophouse until we decide about the nematodes. Young turnip and radish plants. We’re in cold-hardiness zone 7, and our average first frost date of October 14. This makes the first half of August our last chance to sow several vegetables and get crops from them before winter. In 2012 I wrote Last Chance Sowings. Depending on your climate zone, your dates might need to be earlier or later than ours. 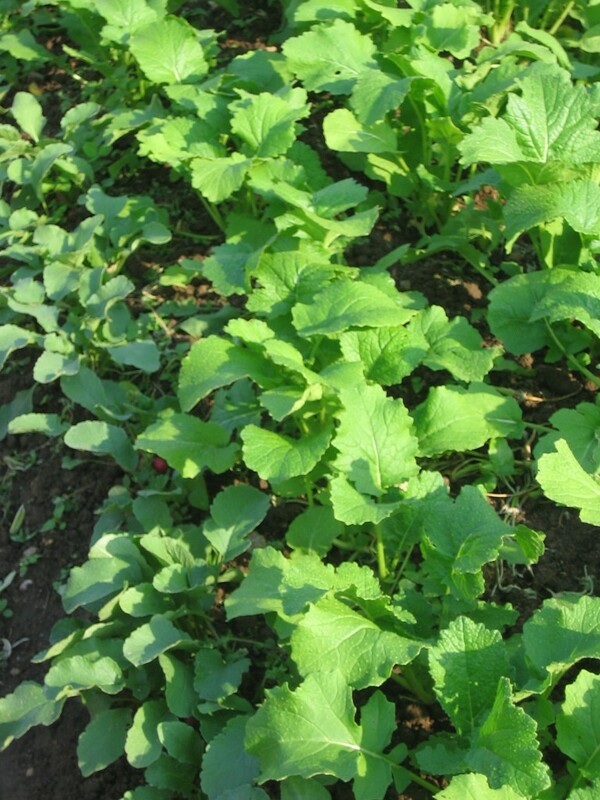 Fall vegetable growing provides fresh harvests, storage crops and possibly some crops to overwinter. Warm weather crops that die with frost. 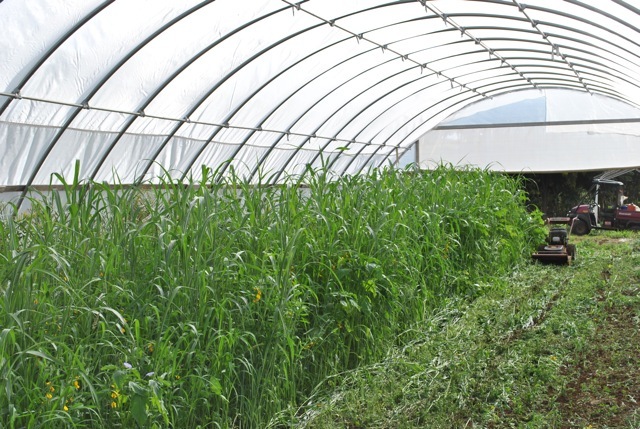 Cool weather crops that grow well in spring and fall, but don’t thrive in the summer. 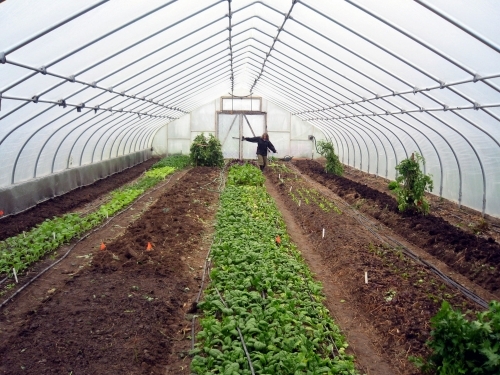 Cold-hardy crops to grow over winter and get off to a fast start in early spring. Planning and timing are crucial – if germination fails, you may not get a second chance with that vegetable. The twin challenges of fall crops are sowing in hot weather, followed by keeping the crop happy in cold weather. For example, yellow squash takes 50 days from sowing to harvest, and our last planting is 8/5, a whole month later than we could risk without rowcover to throw over on chilly nights. Don’t worry that rowcover prevents pollination – you don’t need to get every flower pollinated, just keep the developing fruits growing. In many parts of the country, a frost or two will be followed by a few more weeks of warm weather, so getting past the first few frosts is worth the effort. (Unless you’ve reached the exhaustion point we call “Praying for a Killing Frost.”) It’s easy to get harvests for an extra month from mature plants you already have. Beets, carrots, chard, spinach, lettuce, scallions, peas, potatoes, Asian greens and other leafy brassicas, turnips, rutabagas and radishes all fall in this group. Fall gives you a second chance to enjoy these crops. The flavor of crops produced during warm sunny days and cool nights can be a delightful combination of sweetness and crunchy succulence. We sowed 60% of our fall carrots last week, along with some “indicator beets,” and I ran overhead irrigation Wednesday, Thursday and Friday nights, on a third of the length each time. The indicator beets started to germinate on Sunday, and so yesterday (Monday) we flame-weeded the beds. Last night we got a little rain. Today there are hazy rows of green – germinated carrots! Maybe you’re wondering why we only sowed 60% of what we wanted. Well, we ran out of seed! Embarrassing and annoying, but oh well. More is on order, and it’s not too late to sow them, although they have less time to grow big. Every day counts in the fall! The formula for calculating last sowing dates for frost-tender crops can be modified for hardier vegetables. For example, Early White Vienna Kohlrabi takes 58 days from sowing to harvest (line 1). You can direct sow, so line 2 = 0. You can harvest it all at once and store it in your cooler, so line 3 is 1 day. Assuming you don’t want to use rowcover for this, line 4 = 14. Line 5 = 14 also. That all adds up to 87 days. Kohlrabi is hardy to maybe 15°F. The temperature is not likely to drop to 15°F before the beginning of November here, so counting back 31 days in October, plus 30 in September, plus 31 in August – that’s 92 days already, more than enough. We could sow kohlrabi in early August and get a crop at the end of October. We have made ourselves a chart for fall harvest crops so that we don’t have to calculate each time. It helps us ensure we don’t sow too late to get a decent harvest. We’ve sown two beds of beets, one of kale, some winter radish and fall radish. We’re behind on tilling and prepping beds, or we would have more. We’re experiencing the domino effect of getting late with one task, and then struggling to catch up as more and more tasks get behind-hand. We were late with our potato harvest. And therefore with our broccoli and cabbage transplanting (which uses that plot). Because we are transplanting older plants, we’re removing a couple of the older leaves from each one as we plant, to reduce transpiration losses. We’re late with tilling and bed prep, and therefore with planting. But we do still have hope. One of our mantras (learned from another farm) is “Prioritize planting during the planting season.” Here the planting season extends from early February to November outdoors. We don’t sow spinach till September, so we’re not behind on that yet! 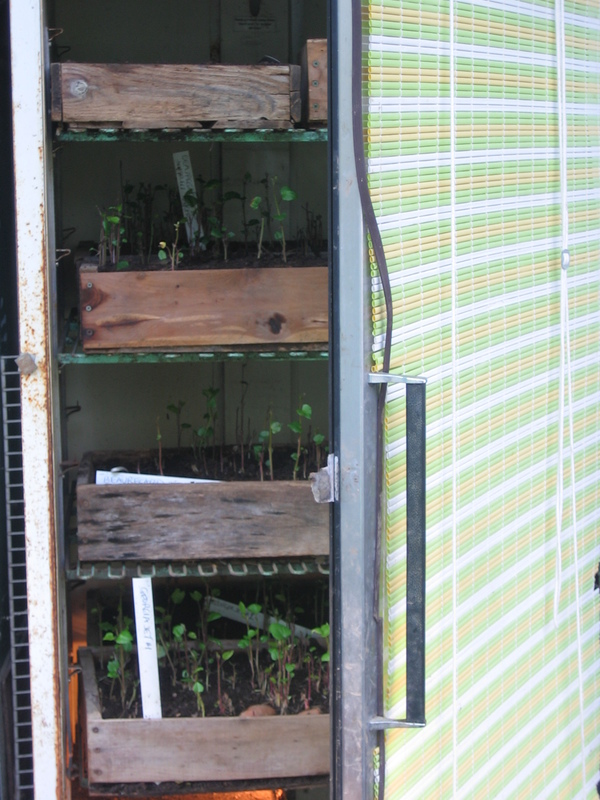 Because spinach germinates so poorly in warm soil, we wait for temperatures to drop. This “summer” has been extremely cool, but we’re in no hurry to start spinach earlier than usual, because of all the other tasks. This year it would probably work. 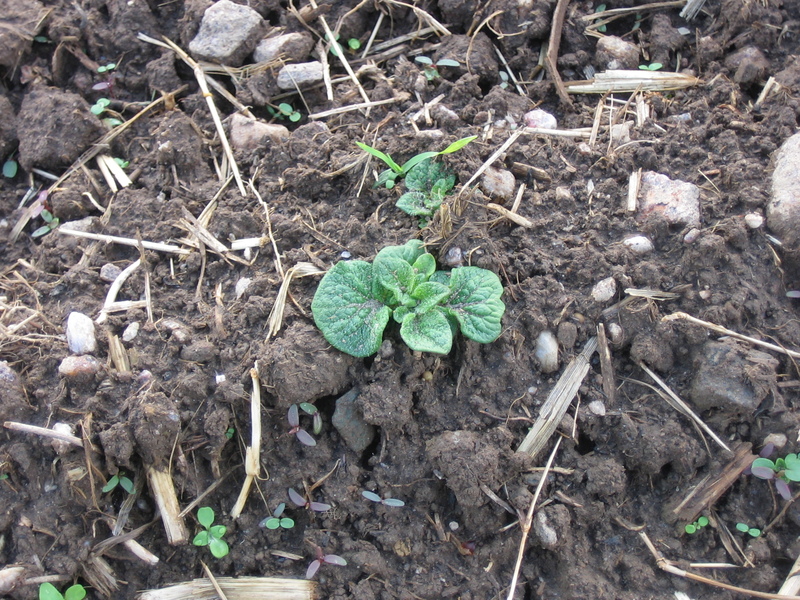 I saw fall dead nettle germinating on 8/4. That’s a phenology sign that the soil is cool enough for spinach. I’ve been recording phenology data here since 2003. 8/4 is the earliest date I have for dead nettle, by a margin of 11 days! It has been as late as 9/1 (2004). I covered this topic in detail in Growing for Market in September 2010, and in my slideshow Cold-hardy winter vegetables. 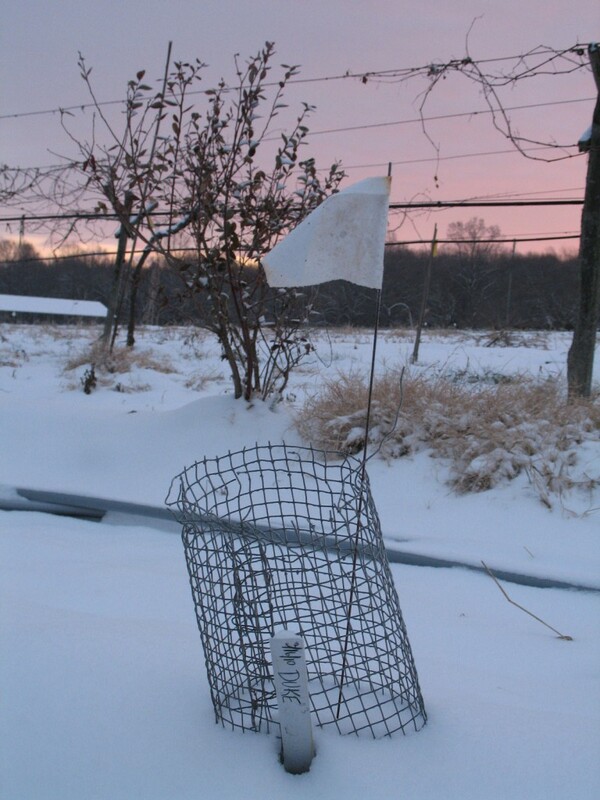 The gist is “Before taking the plunge, know your climate, know your resources, know your market, know your crops, and when you don’t know, experiment on a small scale.” Useful information includes the winter-kill temperature of your desired crop. 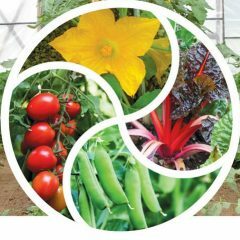 Choose hardy varieties, and be clear about whether you intend to harvest outdoors all winter (kale, spinach, leeks, parsnips, collards for us), or whether you want to have small crops going into winter so you can rest during the winter and be first out the gate in early spring, with crops waiting for you. More of our time in the garden this week is taken up by harvesting (a sign of success), leaving less time to stay on top of the weeds. On Thursday (June 19) we sowed our fourth of six sweet corn plantings. We have a system I like that helps us stay on top of sweet corn weeds. Each time we sow sweet corn, we hoe the previous planting, thin the plants to one every 8-12″ in the row, and wheel hoe or till between the rows. We have got two Valley Oak wheel hoes that we really like. 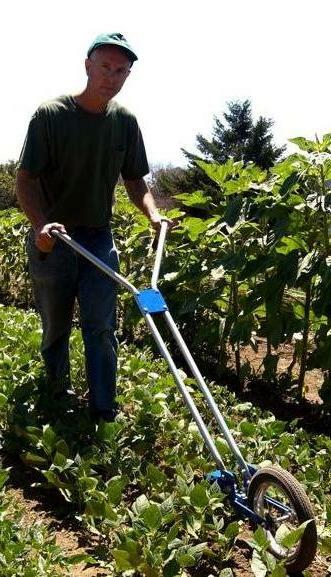 The handle height is adjustable and they are available with different width hoes (and other attachments). We also hoe the rows of the corn planting before that, and till between the rows and sow soybeans. Soybeans will grow in partial shade, handle the foot traffic of harvesting, and provide some nitrogen for the soil. When we harvest the corn we pull out any pigweed that has somehow survived our earlier efforts. I learned at a workshop on Sustainable Weed Management, that pigweed puts out its seeds in one big burst at the end, so pulling up enormous pigweed is worthwhile, if it hasn’t yet seeded. (Actually you can see it for yourself, but before the workshop I hadn’t noticed!) Our soil has improved over the years, so it is now possible to uproot the 5ft pigweeds. Sometimes we have to hold the corn plant down with our feet, but we do almost always succeed in getting the weeds out. Today we at last got our June potatoes in the ground. We had planned for Saturday, but the forecast had rain in it, which would have messed up our chance to do the tractor work to cover and hill them. So we postponed till Monday. Well, no rain happened on Saturday, but a big rain happened early Sunday morning! Grrr! So we postponed till today (Tuesday), and happily were successful. June 16 is our ideal date, giving the potatoes plenty of time to grow before our average first frost date of October 21. I found some interesting maps at Plantmaps.com. You can zoom in on your land. The site also has last frost, winter-hardiness zone, heat zone, drought monitoring, record highs and lows, ecoregions and native plants, on maps for the whole of the USA, and at least parts of Canada. Twin Oaks is in ecoregion 64b – Trap Rock and Conglomerate Uplands! We also sowed more squash (Zephyr and Spineless Perfection Zucchini) and cucumbers (our standard General Lee, or Generally, as we prefer to call it) this week. And released some pedio wasp mummies to kill the Mexican Bean Beetles organically. You can read more about how we do this here. Now we’re fully caught up on planting, we can attack more of the weeds. Tomato transplants waiting in the cold frame. We’re having a very busy time in the garden. Because of late cold weather followed by too much rain at once, all our transplanting has been delayed. We’re up-to-date in the permanent raised beds – we’ve planted out lots of lettuce, senposai, early cabbage, scallions, our first cucumbers and summer squash, and chard, tomatoes, eggplant, celery and okra. We’re also up-to-date on raised bed sowings of carrots, turnips, beets, snap peas, snow peas, bush beans, edamame and asparagus beans. But in the row-crop areas, it’s a different story. 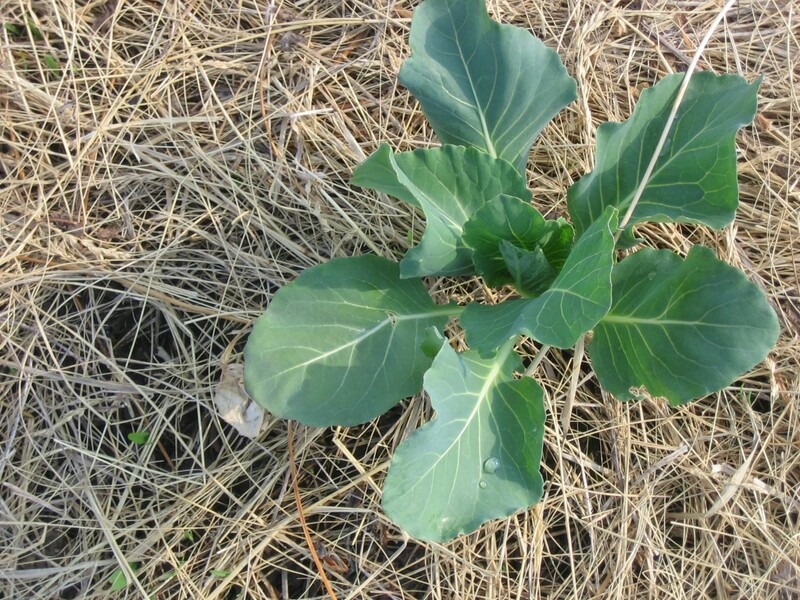 We have planted out our main-crop cabbage and broccoli, our “spring” potatoes and sown our first corn. We’re about a week behind on our big transplantings of Roma paste tomatoes, peppers, melons, sweet potatoes, and therefore watermelons. It’s also time to sow more beans, cucumbers and squash. But we’re getting to it as fast as we can! We’ve added in late afternoon transplanting shifts, and some random evening weeding (which has helped us get the first round of carrot and beet thinning done). Yesterday I measured and flagged the areas for Roma tomatoes, peppers, melons, beans, edamame, watermelon, and sweet potatoes. I set out the mainline tubing for the drip irrigation and dropped the shuttles of drip-tape at the ends of the patch. I wrote about our drip tape shuttles a while back. They are part of our commitment to minimize our agricultural plastic usage by making our plastic stuff last. The shuttles let us fairly easily reuse the drip tape. Re-using drip tape, unreeling it using our shuttle and garden cart system. After running out the drip tape, flushing the lines, capping them off and testing (and fixing!) any leaks, next we’ll roll out biodegradable plastic mulch. This wonderful product has changed our lives! And yet we are not all firmly convinced it is an ecological choice. The language in the accessible information can be confusing. 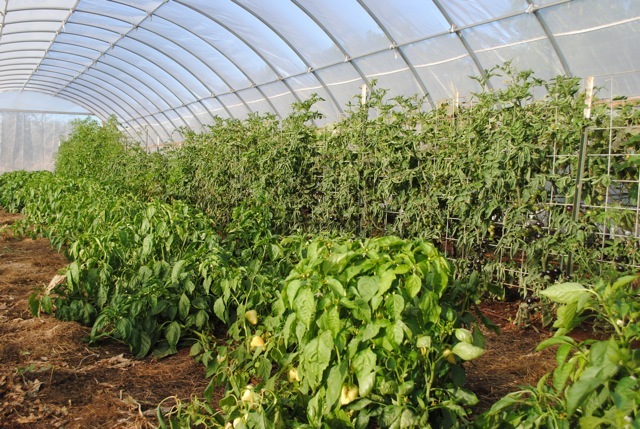 We like using biodegradable plastic because it warms the soil, leading to much earlier crops, it keeps the weeds down for a few months, and then it falls apart, so we don’t have to remove it and add to the heaps of agricultural plastic trash. It’s especially good for vining crops like watermelons and sweet potatoes, because by the time the mulch disintegrates, the vines cover the ground and weeds have little chance. Why we qualify our praise is because it has been hard to find out what it’s made of, and what it disintegrates into. And for some, there’s that knee-jerk reaction to anything plastic! Biodegradable is not the same as bioplastic, nor as bio-based. Bioplastics are a type of plastic made from biological substances rather than from petroleum products alone. Some are biodegradable, some are not. Wikipedia distinguishes two types of bioplastics 1. Oxo-biodegradable plastics (made partly from natural sources, with non-biological additives) – they break down into biodegradable materials; and 2. Plastics made wholly or in part from vegetable material. The second type are often made of cornstarch or sugarcane, but could be made from other agricultural crops. Some biodegrade, others don’t (eg those made from sugarcane ethanol). I found the Wikipedia explanations confusing and some read as if they were funded by petrodollars: “It is difficult to see why . . . resources . . . should be used to produce them when the raw material for conventional plastics is so inexpensive and is available in unlimited quantities.” Really. I found a European Factsheet on bioplastics which clears some of the confusion. There are conventional (petroleum-based) plastics and there are bioplastics. Bioplastics may be divided into three categories. The first is the bioplastics which are not biodegradable. The other two are biodegradable, and differ in whether or not they contain fossil-based materials or only bio-based materials. Our goal would be to get biodegradable bio-based materials. The two most commonly available biodegradable plastic mulches in the US are Eco-One and Bio360 from Canada. Novamont, an Italian company, imports Biotelo, the original mulch film made from their product Mater-Bi. Eco-One describes itself as Oxo-degradable. It claims “Environmentally sound degradation: Laboratory studies indicate that this degradable plastic breaks down into CO2, H2O and biomass without toxic residues. Degrades fully both above and below the soil.” It’s available clear (for encouraging early emergence of sweet corn) and black, including an extended lifespan version for those wanting a 5-6 month window before it degrades, rather than the usual 3-4 months. Bio360 is made by Dubois. It’s entirely biodegradable, and made from Mater-Bi, a non-genetically-modified starch with vegetable oil resin. Mater-Bi® is a wide family of fully biodegradable bioplastics, sold in pellet form to the industry of bioplastic converters. Mater-Bi®’s ingredients consist of plant starches, “mainly corn starch, with fully biodegradable aliphatic-aromatic polymers from both renewable raw materials (mainly vegetable oils) and fossil raw materials. Mater-Bi breaks down into carbon dioxide and water, with no mulch residues in the soil.” (see also the Cornell University 2006, Biodegradable Mulch Product Testing). Ah! So even Mater-Bi contains some fossil raw materials. And of course, fossil fuels are used in the manufacturing process. Life is so full of trade-offs! I found explanation of the chemistry from the Biodegradable Products Institute, as part of a 2012 petition to the USDA National Organic Standards Board to allow “Biodegradable Mulch Film Made From Bioplastics”. The bioplastics they were petitioning for are not polyethylene like regular plastic mulch, but “polyesters, polymers formed by the reaction of a hydroxyl group and a carboxyl group. The natural world is full of ester linkages. Living cells and organisms have developed enzymes to hydrolyze the ester linkage. Examples of natural esters are fats and oils, where three fatty acid molecules are esterified to glycerol/glycerin; natural waxes, where long-chain alcohols are esterified to a fatty acid; and some natural flavors, such as banana flavor, n-amyl acetate, an ester of n-amyl alcohol and acetic acid.” Biodegradable bioplastic mulch film materials can contain carbon black to make the film black to absorb heat from the sun. Or titanium dioxide to create white mulch, which can cool surface soil temperatures slightly, by reflecting most of the sun’s heat. NatureWorks‟ PLA INGEO, Ecoflex® F Blend C1200, Ecovio® F Film and Ecovio® F Blend, Mirel™, were also listed in the petition as suitable Biodegradable Mulch Films made from bioplastics. In contrast, oxo-biodegradable materials were not included in their petition, because they did not fulfill the two criteria proposed to address the concept of “fully biodegradable plastics”. I’ve been buying from Nolt’s Produce Supplies in Leola, PA (717) 656-9764. They sell Bio360 BTB645 4′ x 5000′ for $345 plus shipping, and Eco-One E1B548 4′ x 8000′ for $243 plus shipping. They are a company that doesn’t use email or websites, and they’re closed on major Christian holidays, so don’t call then! Johnny’s sells 32′ lengths for $17.95. Robert Marvel sells whole rolls of Eco-One and Bio360 (call for prices). The first biodegradable plastic we used was Bio-Telo, (Mater-Bi). Since then we have sometimes bought that and sometimes Eco-One. I had not appreciated the difference. Knowing what I know now, I’ll buy the Mater-Bi types in future, rather than the oxo-biodegradable ones. Next time I’ll write about how we set out biodegradable mulches without he use of any machines. Sorry for the delay in posting. I’m working on making improvements to my website, honest! Last night I got home from a very successful Mother Earth News Fair in Asheville, North Carolina. This location was new one for Mother Earth News, and attendance was higher than expected. On Sunday evening one of the staff told me there had been 7000-8000 people. That’s not official. The weather was perfect, and the setting beautifully backed by the mountains. I gave two presentations: Cold-hardy winter vegetables, and Crop rotations for vegetables and cover crops, which I revised for the occasion to be clearer, I hope! Tomorrow I’ll upload it to Slideshare.net, so attendees can watch again, and people who didn’t go can see it for the first time. I did a book-signing, and had a marketing talk with my publishers. I got home to find our garden crew had managed to seize the moment with dry enough soil and get the potatoes planted. It did involve an evening shift covering them. The beds had been prepared for planting broccoli and cabbage, but time ran out. Just as well, maybe. We now have the possibility of a night-time low temperature of 25F tonight and 26F tomorrow. 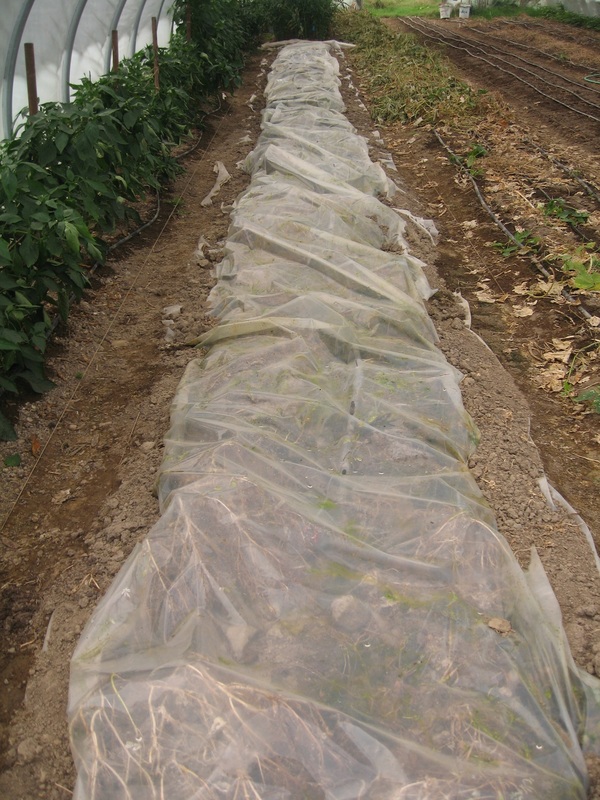 The transplants are better off in the coldframe under several layers of covers. 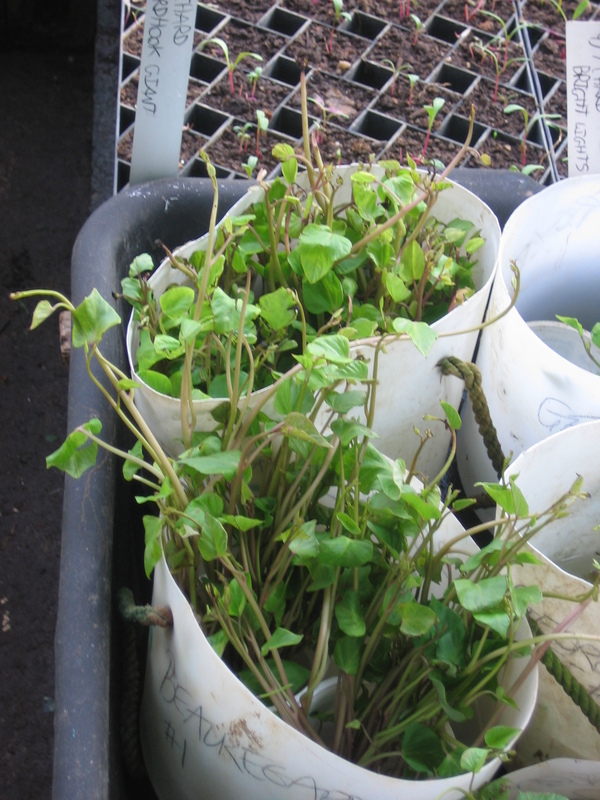 I spent a lot of the day setting rooted sweet potato slips into flats.The link takes you to last spring’s blog post telling more about how we do it. Ten days ago I was behind on my goal for the number of slips in flats. Today I am two weeks ahead, suddenly! Another piece of good news is that the glitch that sometimes made my website repeatedly unavailable has been solved! Author farmerpamPosted on April 15, 2014 Categories Events, This week in the gardenTags Asheville, central Virginia weather, Cold-Hardy Winter Vegetables, Crop Rotations for Vegetables and Cover Crops, growing sweet potato slips, Kathryn Simmons, mother earth news, North Carolina, Pam Dawling's presentations at Mother Earth news Fair, planting potatoes2 Comments on Home from Asheville, potatoes planted, more rain and cold weather. Potato yields, Salanova lettuce review, Yet more snow! 15 years of records on spring plantings (mid-March) gave yield ratios from a very low 3:1 to a happy 13:1. The average was 8.2:1 and the median 8:1. 16 years of records on the mid-June planting gave yield ratios ranging from a miserable 3:1 to a high of 10.7:1. The average was 7:1, and the median the same. We used to plant at 10″ in-row spacing and have shifted to 12″. These figures contain both, with no obvious difference. Looking at these results points out to me an advantage of doing two plantings that I didn’t mention during my presentation: a poor spring result can be followed by a good summer result. And vice versa. The 13:1 spring result was followed by 4.8:1 in the summer. The 3:1 spring yield was followed by 7.2:1 from the June planting. Doing two plantings spreads the risk. The questioner also asked if we get potato beetles. We do get them in the spring and spray once, occasionally twice, with Spinosad, which is organically acceptable. In the summer we get no potato beetles. I think the mulch helps. Adult potato beetles emerging from the soil have to walk to find potato plants, and I bet the mulch is very challenging! We use the same varieties in both plantings, Red Pontiac and Kennebec. Kennebec stores better, Red Pontiac gives higher yields, but isn’t good for long term storage. That said, we recently finished eating Red Pontiacs from our October harvest. I haven’t done much research into trying other varieties because we just buy what’s available locally.The Irish Eyes catalog has descriptions of varieties better for certain conditions. Moose Tubers (Fedco Seeds) has a useful comparative chart of varieties. My impulse buy when ordering seeds last year was the full set of Salanova Lettuce from Johnny’s. These are varieties of lettuce bred for baby salad mix. You grow them as transplanted heads, and when the head is mature you cut the whole thing and bingo – you get a bowlful of small leaves. They do not grow big leaves, just more and more small leaves. Some of them have a core which you need to cut out in order to make the leaves fall apart. Others you just cut across at the base .If you’ve ever grown Tango, you’ll now the kind of thing. As well as being very pretty, these lettuces are said to save you time at harvesting compared to cutting along a row of baby lettuce mix. This aspect really appealed to some of our crew. Because the seed is expensive (100 pelleted seeds for $15.95), we decided to grow these for our hoophouse “filler” heads, which we transplant into gaps that happen in our beds of head and leaf lettuce. That way we’d get them at the time of year (late winter/early spring) when we grow baby lettuce mix and we could do a direct comparison. We bought the full set, 100 seeds of the Foundation Collection (the more frilly types) and 100 seeds of the Premier Collection (the more flat and lobed types). Each collection is 25 seeds each of four varieties. We sowed each type in a 4′ seed row (seeds 2 inches apart) on 10/23. They came up well, and we transplanted them 1/2/14. We just started using them 3/20, so the jury is still out. Some unfortunately got cut before reaching full size. I’m not sure what full size is yet. Next year, I’d sow them earlier, so that the heads mature sooner. This winter has been very cold, they may have grown slower than they could have – some other seedlings are certainly slowed down. A couple of them are exceptionally pretty. The Red Butter type has beautiful very dark red simple shaped leaves. The Red Sweet Crisp reminds me of a fine seaweed in looks – green at the base and intense dark red at the tips. The Green Sweet Crisp is surprisingly sweet, in a good way. Winter lettuce mixes are not usually crisp or sweet. Osborne Seeds Multileaf Multi-red Lettuce. Photo from their website. Also next year, I’d like to compare these with some “Multileaf” varieties from Osborne Seeds. They have 7 varieties, 3 green and 4 red. It took me a little while to realize “multired” was “multi-red” and not the past tense of “to multire”, a verb I was pondering the meaning of! They are $7 – $7.47 for 500 pelleted seeds. Some are back-ordered right now, but I’d want them next winter anyway. I’d also like to do a side-by-side comparison with Tango, Oscarde and Panisse which are inclined towards packing in many small leaves without further marketing. And finally, yes, we’re expecting some more possible snow tomorrow morning. Can you believe it? Maybe we’ll just get rain. 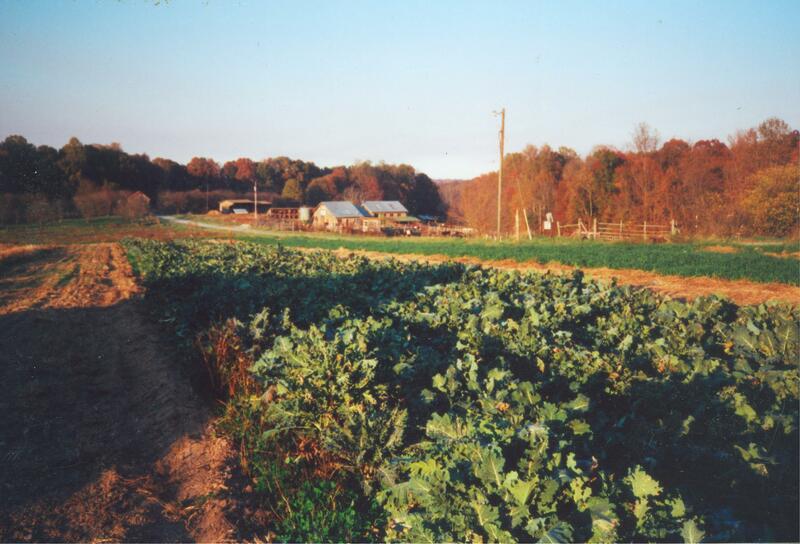 Author farmerpamPosted on March 24, 2014 June 20, 2016 Categories Events, farm planning, hoophouse, Lettuce varieties, This week in the gardenTags baby lettuce, central Virginia weather, Feed the Soil presentation, Irish Eyes Potato and Seed company, Johnnys Salanova lettuce, Kennebec potatoes, Lynchburg College, Moose Tubers (Fedco Seeds), multileaf lettuce, Osborne Seeds, Oscarde, Panisse, potato beetles, potato varieties, Red Pontiac potatoes, relative potato yields from March and June plantings, Salanova Lettuce, spinosad, Tango, yield ratio for June planted potatoes, Yield ratio for March planted potatoes1 Comment on Potato yields, Salanova lettuce review, Yet more snow! My presentation on Crop Planning to the CSA Expert Exchange Online Conference on Friday 3/7 went well, after a short delay due to slow website loading. Joys of rural living! I just learned that our Internet runs slow on rainy days because the water in the soil affects the underground cables. A s a farmer, I’m very used to considering the effects of the weather, But I never would have guessed this one. Now I realize I jinx myself when I work outside in nice weather and do my desk work while it’s raining! Spinach bed with a row of peas in the middle. This week has been challenging in the garden because of snow followed by very wet soil. On Monday we managed to transplant a bed of spinach and the first week’s round of lettuce. That felt like great progress! Even though it is a month later than we would “normally” hope to do those tasks! We chose to work on the driest section of the raised bed area. Before that we had been weeding the grapes and spreading compost. Having some perennials to take care of makes good use of our time in the winter, early spring, and whenever cultivated soil is too boggy to step on (in). These considerations are all part of a list we keep to help us choose tasks suited to the conditions, so we can make best use of our time without doing damage. A lot of our garden work is done on 3 or 4 hour shifts with up to 11 people. The honcho needs to be on the ball to keep all those people gainfully employed! Our honchos/honchas are the more experienced people, and will usually prepare for the shift beforehand, making a list of possibilities. Some of the shift time is harvesting (only spinach currently, apart from getting potatoes from the root cellar and sweet potatoes from the basement). That’s our top priority. We try to get some harvesting done even if it’s very cold or raining lightly. The crops that wilt fastest get picked close to the end of the harvesting period, so they don’t deteriorate while we get other crops. We are often including visitors in our work, so we need to make sure we mix up members and visitors on each task, so that visitors get enough directions and help. We also need to check in to see how they’re doing with the heat/cold and level of physical activity. We don’t want them to collapse! We also need to be firm about pulling them off a job if they are causing damage, and trying to find some other task that might suit them better. Having the entire crew finish the shift at the same time is complex choreography! Putting tools away as we go along helps reduce a mammoth task at the end, although having some people cleaning and storing tools as the finish time approaches can be a good way of evening out the workload. The honcho needs to pace the planting, watering and rowcovering. It’s no good transplanting 500 feet if you don’t get it watered and covered before leaving the scene. Sometimes it’s easier to start everyone on a big hoeing or weeding project, then leave an experienced person in charge of the straightforward task and most of the crew, while you pull out a couple of people to get a complicated task started. Next add more people once it’s up and running. Or send one or two experienced people over to set up, and then send more crew over as the set up work is done It’s awful having 9 people stand there while you try to figure out how to do a planting!. If the day is likely to be very hot, have an “aerobic segment” at the beginning of the shift and get the physically taxing tasks done first (especially anything involving shovels). 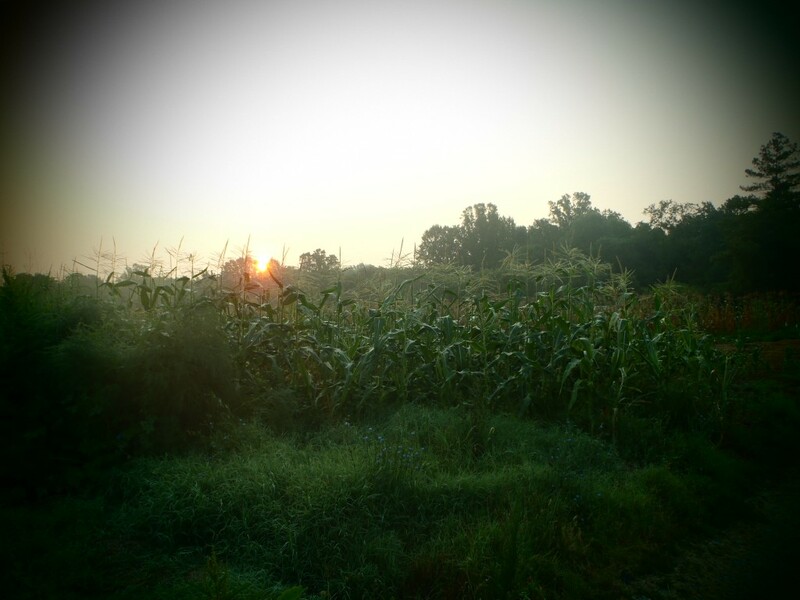 If the morning starts out with a heavy dew, postpone harvesting cucurbits, nightshades, strawberries and legumes until the leaves dry, to reduce the spread of disease. After heavy rain: mulched perennials (fruit and asparagus) are the easiest places to work without getting bogged down. Don’t work in sinking mud, it compacts the soil, which means the plants go short on air, and the soil will be slower to drain after future rains.. Standing on boards is an option for harvesting or planting.. If heavy rain is expected and you might have to stop in a hurry, do weeding, not planting. Don’t hoe if it’s about to rain, it’s a waste of time. Hoeing is best done in an area that won’t get irrigated that night. Likewise don’t leave pulled weeds on the beds before rain. They’ll re-root. If you feel frazzled, choose a big simple task lots of people can do, like weeding strawberries, or hoeing corn. 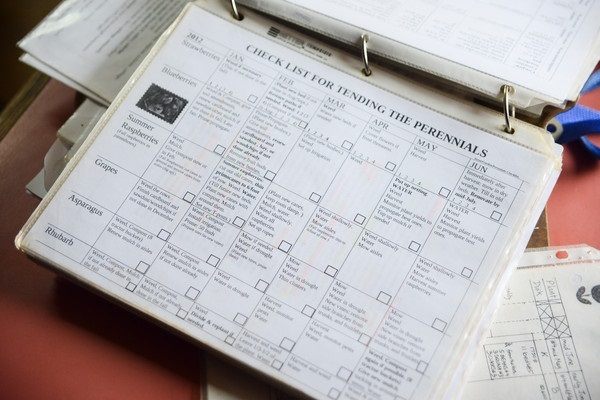 Or choose two tasks geographically close, so it’s easy to keep an eye on everything happening.